Part One (1-25 pages) newspapers clippings from 1985 through June 1986 about the discovery of the 1889 Boundary Agreement between NJ and NY and the media and public reaction. Includes article that broke story and political cartoons about claim. Part Two (26-52 pages) newspaper clippings continued. Kevin Wright's seven page paper on the 1834 Boundary Compact and 1889 Boundary Agreement between New Jersey and New York. 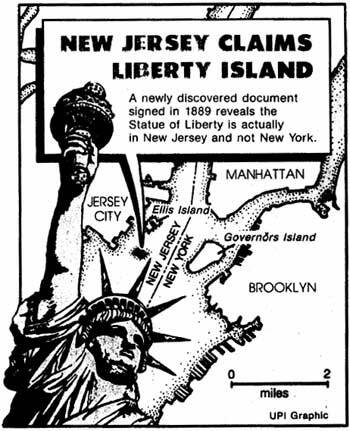 The agreement determines that Bedloe's (now Liberty) and Ellis Islands are in New Jersey. This logo is a recent example of NJ communities that have since identified with the Statue of Liberty and understand the value of this symbol to their community.